Tricking your brain into eating less by serving a meal on a smaller plate is a weight-loss tip that's been around for a while. The problem is, according to a new study, it simply may not work. The research, published in the journal Appetite, found that when people are hungry they're more likely to accurately identify portion size, regardless of the way food is presented. "Plate size doesn't matter as much as we think it does," says lead author Dr Tzvi Ganel. "Even if you're hungry and haven't eaten, or are trying to cut back on portions, a serving looks similar whether it fills a smaller plate or is surrounded by empty space on a larger one." Dr Ganel and his team explored the impact of food deprivation on a person's susceptibility to what's known as the Delbouef illusion. 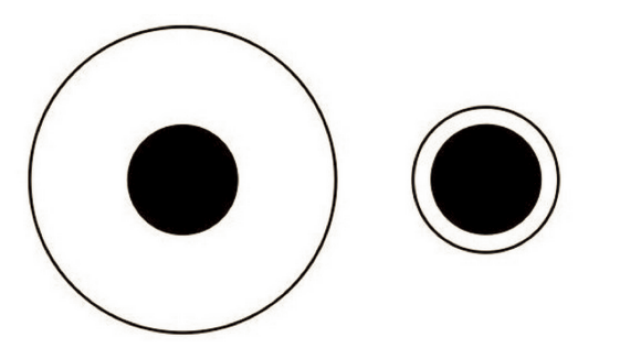 First discovered in 1865, in the classic experiment, people are shown two black circles of the same size. The circles are embedded in two different circles, one bigger than the other. People perceive that the circle is smaller when embedded in the bigger circle. And that's why it's often touted as a portion-control method. "If you want to lose weight, use smaller china and flatware," said researcher, Koert van Ittersum, after publishing a seminal study on serving sizes and overeating in 2006. "While 4 ounces of food on an 8-ounce plate might look like a good helping, 4 ounces on a 10-ouce plate could seem skimpy." But not according to this study, however. Dr Ganel and his team found that participants who hadn't eaten for at least three hours were more likely to correctly identify the proportions of pizza placed on larger and smaller trays than those who had eaten recently. "Over the last decade, restaurants and other food businesses have been using progressively smaller dishes to conform to the perceptual bias that it will reduce food consumption," says Dr. Ganel. "This study debunks that notion. "When people are hungry, especially when dieting, they are less likely to be fooled by the plate size, more likely to realise they are eating less and more prone to overeating later."